One of the things that I miss most about Singapore, besides my family, is the weekly dim sum brunch that I used to have at either Crystal Jade or Lei Garden. Over the last seven months, I have been searching high and low for a good dim sum place and have always been vaguely disappointed by the various places that I've been to. These places include a michelin-starred place, some places in Bayswater that seem popular with the Asian crowd and several others here and there. Don't get me wrong, some of these were actually quite good and I would absolutely go again but I guess I've been looking for a place that would match up to what I could get back home. About a month ago, while looking through some restaurant guides for a weekend brunch, I chanced upon Shanghai Blues, a modern Chinese restaurant in Holburn that also served dim sum. Most of the the reviews I read were favorable so I booked us a table, hoping that this would be the place that I was searching for. Although I found the restuarant location to be slightly out of the way, my first impresions were positive. 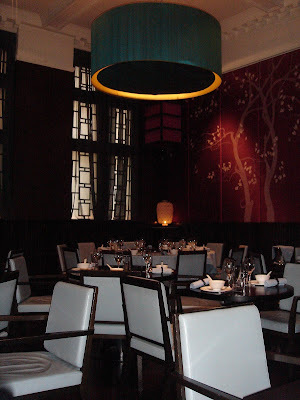 The decor is decidedly modern and although a little on the dark side, evokes a feel similar to that of E&O and Yauatcha. I was a little worried when I noticed the place to be fairly empty despite it being 12:30pm but took comfort in the fact that many of the diners that were there were Asian. After being shown to our table, I started perusing the menu. The menu is fairly extensive and offers a mix of traditional Chinese dishes such as xiao long bao and har gow (shrimp dumplings), as well as more inventive creations such as barbecued chilean sea bass rolls. Since M and I were both longing for the flavours we used to get back in Singapore, our order consisted of mostly traditional dim sum offerings including xiao long bao (shanghai soup dumplings), shanghai chilli dumplings, pan-fried turnip paste with XO sauce, cha siu bao, cheong fun (rice noodle rolls) and kai lan in oyster sauce. The dishes arrived in fairly short order and soon we were tucking into the spread that lay before us. From the first bite, I was decidedly impressed. On the whole, the food was flavorful and tasted authentic. In particular, the xiao long bao was exquisite - probably the best I've had in London thus far. The skin was not too thick, which I've found that they often are here in London, and the soup inside was delicious and just the right temperature. The shanghai chilli dumplings, another favourite of ours in Singapore, were also yummy with the right amount of kick in its spice. I was further impressed when I had my first bite of the pan-fried turnip paste - it was even better than what I've had in the past in Singapore. While the turnip cake in Singapore tends to be of a fairly dense texture, the Shanghai Blues rendition had a crisp exterior with a meltingly soft interior. Not all was perfect, however. I was somewhat disappointed by the cheong fun - usually one of my favourite dim sum dishes - as I found the ratio of noodle to filling somewhat overpowering. All in all, though, Shanghai Blues definitely ranks as the best dim sum I've had to date in London. I just returned for my second visit this past weekend (which is when I had the chance to take these pictures you see here) and had another good dining experience. This time I also got to try the aforementioned barbecued chilean sea bass rolls and the salted chicken and peanut congee. Again, both were delicious and I'll be having them again the next time I go. Is Shanghai Blues better than Crystal Jade back home? 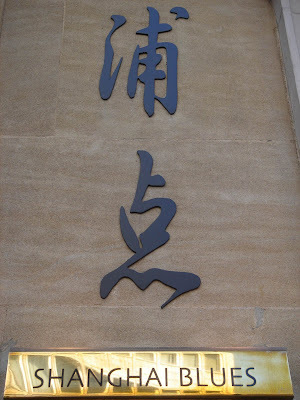 Probably not, but unless I find something better, Shanghai Blues is going to be my go-to dim sum place here in London!